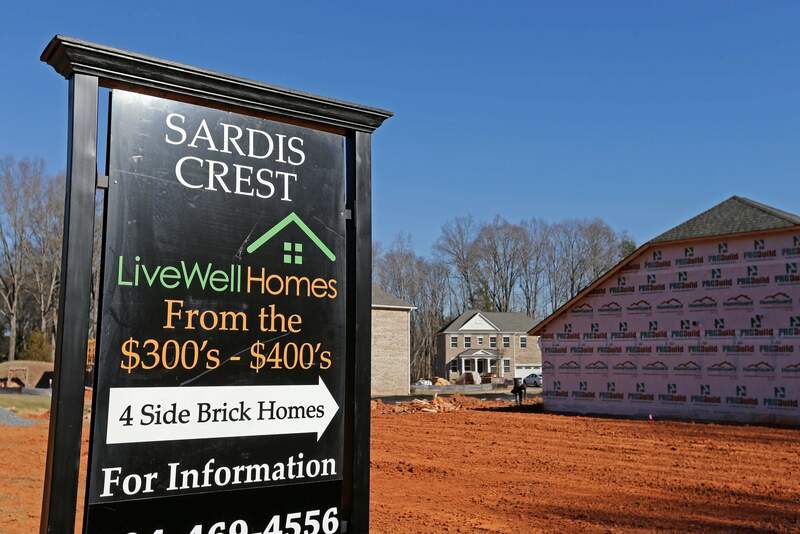 New homes are under construction and for sale in Charlotte, N.C.
WASHINGTON – Americans responded to higher mortgage rates by snapping up new homes in February at the fastest pace since July. New-home sales rose 6.1 percent month-over-month to a seasonally adjusted annual rate of 592,000, the Commerce Department said Thursday. That sales pace is nearly 13 percent higher than February of last year, a positive sign for the housing market that demand is robust at the start of the spring home-buying season. Healthy job growth and a recovering economy have pushed up interest in new homes, while the prospect of rising mortgage rates since the November presidential election may have pulled some sales forward. Builders have ramped up the construction of new homes, which helps meet strong demand and boosts sales. That could provide a slight lift to the broader economy through construction jobs and the consumer spending linked to home purchases. But demand for homes is still outpacing the construction gains. There were 266,000 new homes for sale last month, the most since July 2009 – a month after the recession ended – and up nearly 10 percent from a year earlier. The median sales price in February of a new home was $296,200, a decline that might reflect that much of the sales last month were in the cheaper Southern markets. Construction firms are bullish that sales will keep improving, even though they remain well below the heights of the housing boom seen more than a decade ago. The National Association of Home Builders/Wells Fargo builder sentiment index climbed to 71 this month, the highest reading since June 2005. Some buyers may be looking to lock-in their purchases out of concern that mortgage rates will rise, possibly hurting affordability. Mortgage buyer Freddie Mac said Thursday the average rate on 30-year, fixed-rate home loans this week was 4.23 percent. That represents a slight decline from the prior week, but it’s significantly higher than the 3.65 percent average last year.